The solid bright teal cotton blends in with the multi-color hand-dyed silk/rayon, and in this view isn’t distinguishable — but it does a wonderful job of brightening the over-all effect. 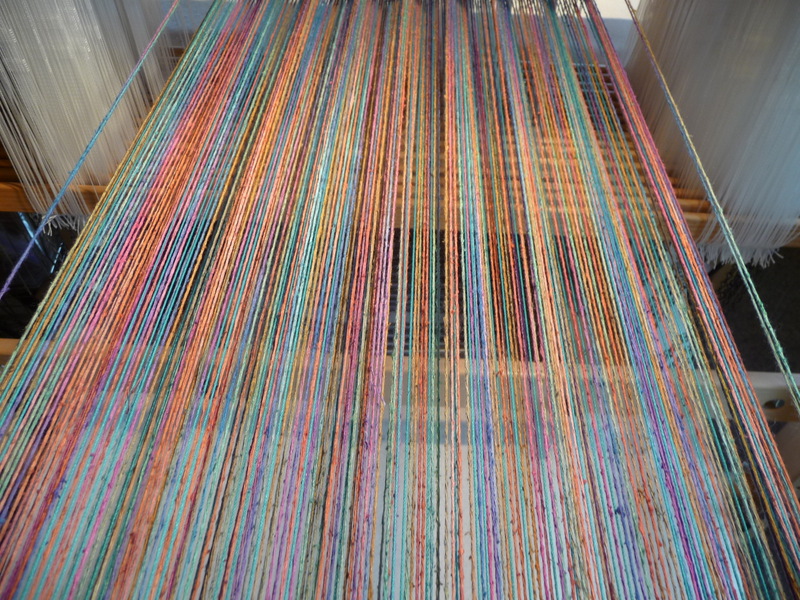 This view is at the front of the loom, where I’ll begin the weaving. 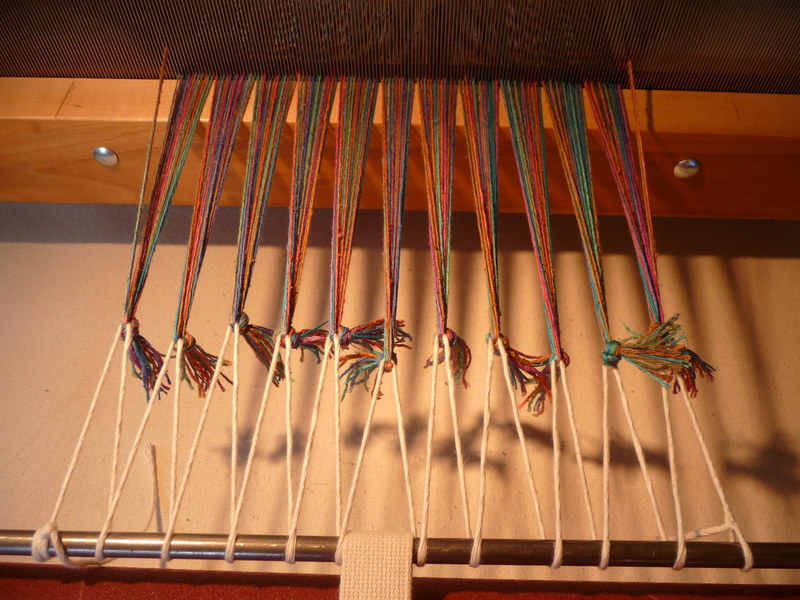 The technique I use to attach the warp threads to the front apron rod is called “lashing on”. It enables me to easily adjust the warp tension evenly across the width of the warp, which is important to the quality of the finished cloth. My fears that the kittens would make this process difficult today (think playing with all those threads hanging off the front of the loom as I wound them toward the back) were, as it turned out, unfounded. They were napping in their nest in my closet for most of the afternoon. Big sigh of relief. About to try this technique for the first time. How long do you estimate the lashing cord? I’ve read everything from 3x, 4x, and 5x the width of the project. Do you work close to the apron rod or close to the reed when you are setting up to lash on? Thanks! 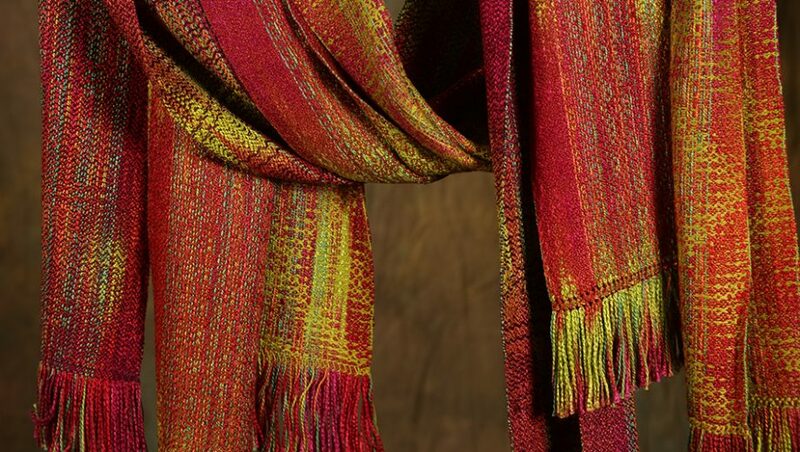 always impressive is the detail and time that goes into this … I think I’ll stick to knitting!